This guide is aimed towards beginners and hobbyists like myself. My goal was to provide a quick and easy guide while exposing the more technical (but hopefully simple) explanations as well. I hope this helps! A camera with manual mode or “M”. This allows you to adjust the shutter speed. We are going for longer exposure times by slowing down the shutter speed. A lens with decent zoom (50mm-200mm works well for me). We want the flexibility to zoom in and zoom out as needed. A tripod. This can’t be skipped. A tripod provides stability for the camera, which is required for in-focus pictures that also have longer exposure times. A timer on your camera. This ensures our camera won’t shake and introduce blurriness as a result of pressing the shutter button. You could also use a remote trigger if you have one and use “bulb mode” for shutter speed instead of the listed values in this article. Scout a spot in advance that gives you a clear view of the fireworks with room to breath. The closer in to the fireworks, the more difficult to get a full shot. The farther away, the more zoom you may need on your lens. Make sure there are no obstructions in the way like the tree pictured to the right. Set up your tripod and camera, positioning it to where you expect to see the fireworks. Imagine the size and location of the fireworks. Try to frame that area with your camera. Move locations if you find you can’t get a good frame. 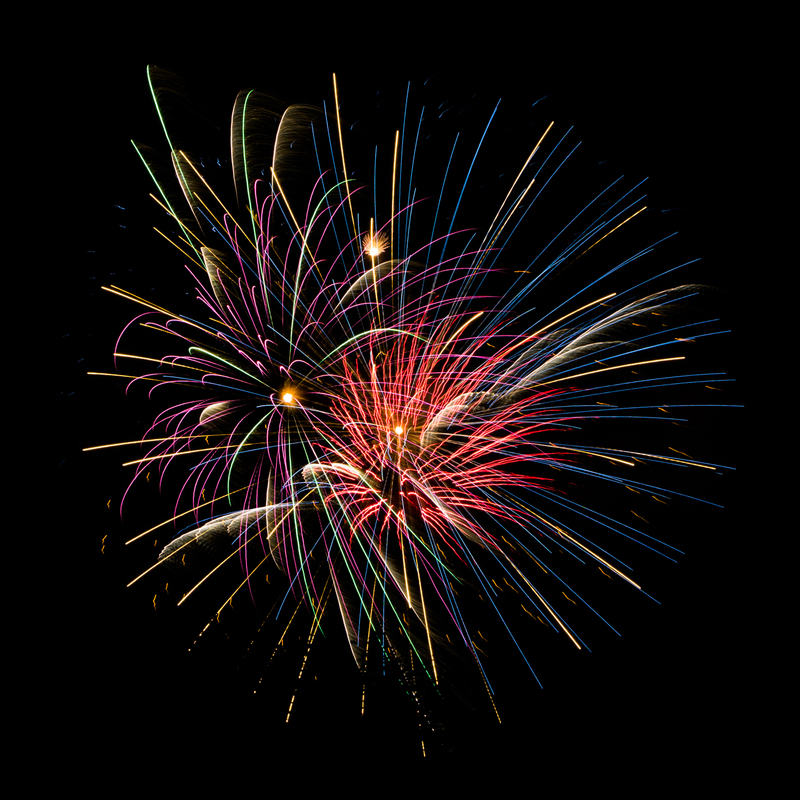 When the fireworks begin, take a few test shots to adjust focus and exposure. If your test shots are too light (overexposed), increase your aperture value (i.e. from f/8 to f/10). If your test shots are too dark (underexposed), slow your shutter speed (i.e. from 3 to 4 seconds). Don’t forget to check your stability: Make sure your tripod and camera are kept stable during photo capturing. If you are using a timer, make sure the timer is long enough that your camera doesn’t shake by the time it is taking the photo. If you are using auto focus, once you have acquired a focused shot, switch it to manual so the camera remembers that setting and doesn’t attempt to change it. If you are using manual focus, start at infinity (if there is a mark for that on your camera) and adjust as needed. If you do not know where infinity is, start at the farthest setting and work your way down. On my camera, I set it to auto focus, switch from manual camera mode to fireworks camera mode (my camera happens to have a mode for that), acquire focus, then flip back to manual focus. This retains and locks in good focus for fireworks. Then, I flip back to manual camera mode so I may continue to control and adjust other settings such as shutter priority and aperture. 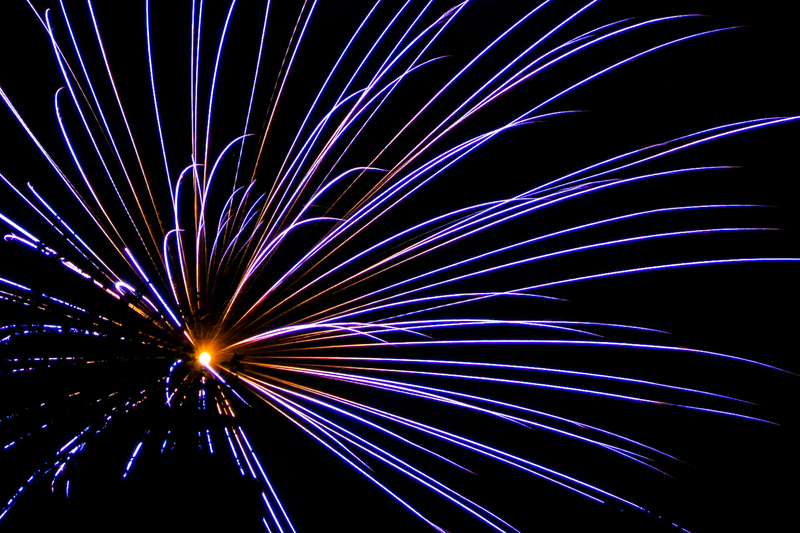 Quantity: If you want to capture more fireworks in one shot, slow down the shutter speed and increase the aperture value. If you have too many, do the opposite. 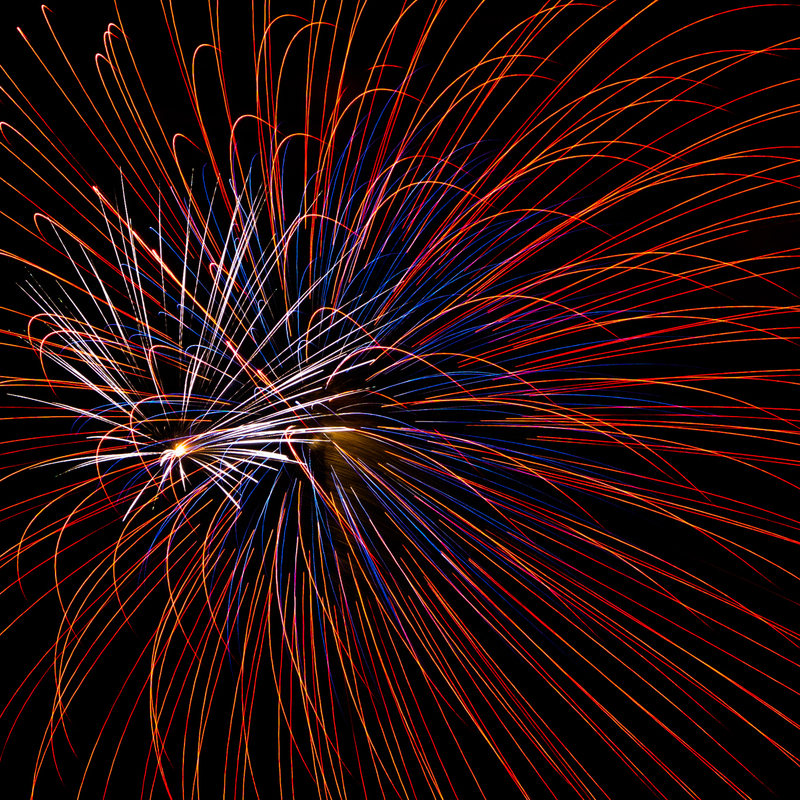 Movement: If your shots lack the movement of the fireworks, slow down the shutter speed and increase the aperture value.If they’re too stringy and messy, do the opposite. 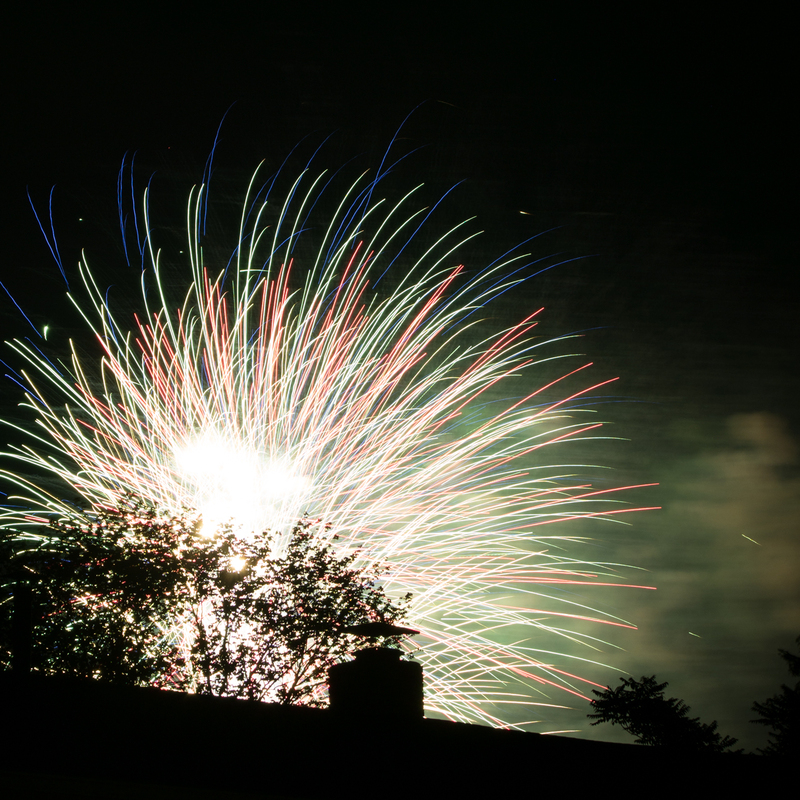 I did not anticipate the grande finale and kept my shutter speed at 2.5 seconds. I captured too many fireworks within that time frame, resulting in a blob of explosions. Next time, I’ll speed up the shutter speed and lower aperture value. Reduce Smoke: As the show goes on, there is more smoke that may pollute your pictures. So you may want to set yourself up to take your best shots early on in the show. If you are shooting in raw mode and have post-processing software (i.e. Lightroom or Photoshop), you can adjust the photo later to reduce the smoke pollution if needed. I highly recommend shooting in raw mode and using a post-processor. 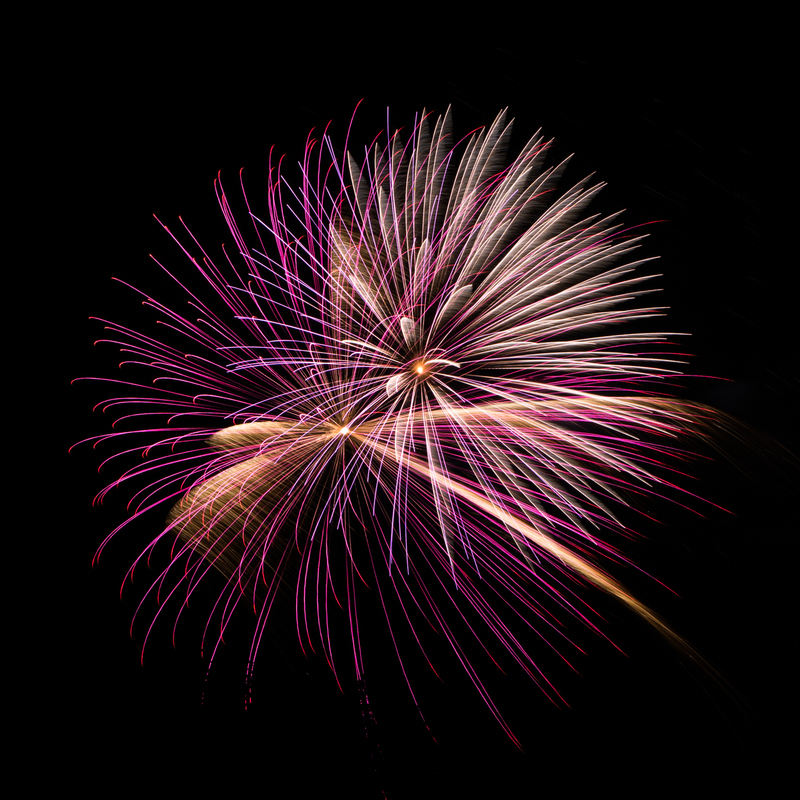 Capture Finale: As the timing of fireworks speed up, you should also speed up your shutter speed (i.e. from 4 seconds to 3 seconds). As you increase the speed, you should also lower the aperture value so that your pictures do not end up too dark (underexposed). Lower the aperture, for example, from f/11 to f/8 to allow more light in. Good luck, and Happy Fourth! Please let me know if you have questions or comments by emailing me at photography@aileenkeil.com.